Round Top Area Historical Society "Our History is Our Passion"
﻿You will need Adobe Reader to open this document..
# 6. How many stagecoach stations were close to ​Round Top? Choose one below - then click on answer button. At the end of the 1890s with two saloons in town it became apparent for the need to occasionally let a disorderly person have a place to "sleep it off". So this 10' by 10' “calaboose” (jail) was built. Once daylight appeared the now sober person would pay a fine and go on their way. If someone committed a serious crime they also would be placed in the calaboose and the Fayette County Sheriff would be notified by telegraph. In the early days it would take several hours for a deputy to reach Round Top by horseback or wagon to transport the prisoner back to the Fayette County jail in La Grange. 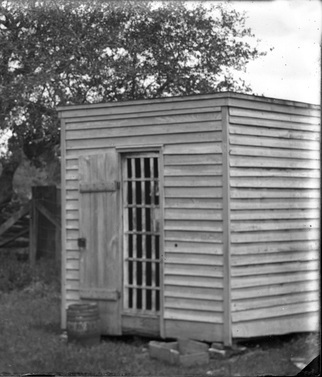 By the early 1920s, the calaboose was done away with, due to quicker means of transportation to the county jail. In the year 2000 the population was 77 but the population in 2010 moved up to 90. Who knows, by 2020 we may be in "triple" digit territory. This is not Round Top's highest or lowest population. ​To learn more about Round Top history take our Round Top History Quiz on the Home Page of this site.